I promised myself I'd wall Hibari's number 1 scan. He finally beat dame!Tsuna with a generous number of 3515 extra votes. I kept wondering why isn't he top ever since Katekyo polls started off. Anyway, I fit the background to his color scheme and added blue, because in the anime if I'm not wrong his eyes were blue and I think it fits him very well. 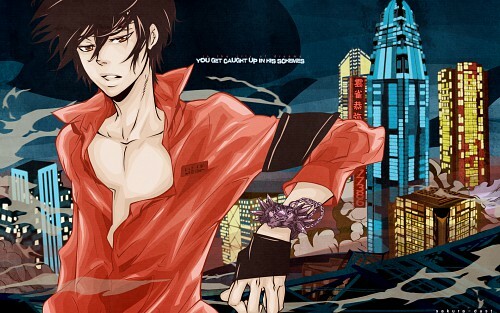 For some reason almost all my Hibari walls are him with a city. I don't know why I think the city background fits him so much. Maybe because he's got badass written all over and is the king of anything he touches. Well, here's the render at AP, I had to crop it a bit in my wall, but on AP I posted the full version: here. Whoa, that's really awesome! Your vectoring good as always! But what I really like what bg you choosed. It really fits great and looks amazing with Hibari, also I like that you picked up another colors for it. obviously I am faving this! I actually like the whole wall. It has a nice modern vibe to it. Your vectoring is really awesome and very noticable. I'd prefer it if he is wearing something black or dark blue. I think it will have a more badass feel to it xD but that's just me ^^ Still this is HOT! it's meant to be cool pose. I love the city and the vectoring is messy but in an awesome way. It's nice to see something so heavily shaded but in a cool refreshing way, rather than a suffocating way. Awesome job! It looks super! No inspiration for a comment, so i'll just fav this freaking awesome piece. Super cool wall of Hibari! I love all of the different colors. Thanks for sharing! Oh cool, I took your vector from AP, apparently I haven't found need to log in there since 2006, LOL! cool! i like it! although i didn;t watch the series, but i like Hibari. Hibari! *nosebleed* Very nice wallpaper ... the colours are nice and the background it's interesting.